Hey guys! How was your weekend? If you guys follow me on Instagram, you may have noticed that hubby and I were in Montreal. Boy oh boy, did we eat well! We had a little trip to celebrate our anniversary, which is actually today! We’ve been married for 13 years (and been together for 22 !!) It’s been a blast so far and looking forward to the next 22 years making memories with my BFF. You may be wondering what type of berries are in my pics. They are dogberries that grow on the dogberry tree. These trees are quite popular in Newfoundland and can be found all throughout the Province this time of year. Dogberries are hard to miss because of their beautiful red colour. At our wedding ceremony we had some around for decoration, along with pumpkins and the like – it was definitely a fall wedding. Like most crostini, these are pretty easy to assemble (and even easier to eat). Prosciutto is crisped in the oven and acorn squash is roasted for about 15 minutes until golden brown. The squash is diced in small pieces so it doesn’t take long to cook through. Before roasting, I tossed with Herbes de Provence. I use this quite often (especially for roasted potatoes). You can usually find it in the grocery store where you would find other herbs. Herbes de Provence is basically a mixture of herbs, typically thyme, lavender, rosemary and oregano. If you don’t have this on hand, you can use a pinch of each of these herbs or even just thyme would work lovely. Before I go, I want to give a shout out to Annie from New York as the winner drawn for the copy of More Than Poutine on my giveaway! Enjoy Annie! Preheat oven to 375F. Toss acorn squash with 1.5 tbsp. of olive oil, salt, pepper and Herbes de Provence (or thyme). 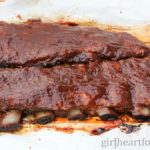 Place on baking sheet and bake 15-20 minutes until tender and golden. Carefully remove from oven. The last 5-6 minutes of the acorn squash roasting, place prosciutto on a sheet pan and cook in oven alongside for 5-6 minutes or until crispy. Don't burn. Carefully remove and lay to one side. Brush slices of baguette with remaining 1/2 tbsp. of olive oil. Turn oven to broil and crisp about 2 minutes per side. Watch to ensure it doesn't burn. Carefully remove from oven. 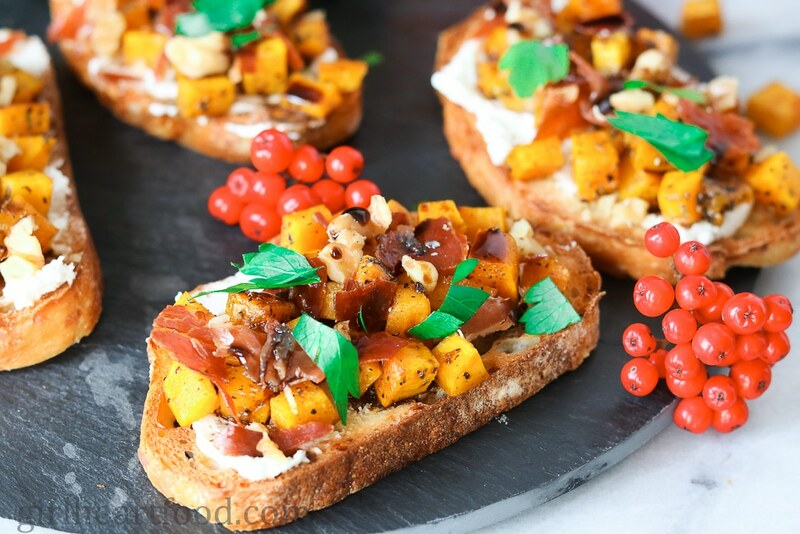 Spread goat cheese equally among bread slices, top with roasted acorn squash, walnuts, crispy prosciutto (crumbled) and walnuts. Drizzle with balsamic reduction. Garnish with parsley, if desired. Enjoy immediately. Wow! All the flavors in this gorgeous crostini are calling. Y name. Goat cheese is one of my favorites. Yum! I absolutely love baked squash. This recipe sounds like a blast! I love it. I love all the flavors you combined here – the prosciutto and the goat cheese. Oh man, I can’t wait to make this. Saving. and sharing. Yay! So happy to hear that! Hope you love it, Natalie 🙂 Thanks so much! i have eaten with my eyes, now have to try this soon. Crostinis look so pretty and filling. A meal in itself. Haha – know what ya mean 😉 Thanks so much! This looks so good! You see so many good Fall desserts and snacks but this has got to be the best appetizer ever for the Fall! Cannot wait to try it! Thanks a bunch for the kind comment, Kelsey 🙂 Enjoy!